* Senior club appearances and goals counted for the domestic league only and correct as of 15:43, 12 November 2016 (UTC). Kyle Andrew Walker (born 28 May 1990) is an English professional footballer who plays as a right-back for Premier League club Tottenham Hotspur and the England national team. Walker was born in Sheffield, South Yorkshire and grew up in the Sharrow area of the city. He attended Porter Croft Infant & Junior School, followed by High Storrs School until 2006. Walker joined boyhood club Sheffield United at the age of seven after being recommended by Football Unites, Racism Divides and progressed through the ranks to become a regular fixture in the reserves by 2008. In November 2008, he was allowed to join League One side Northampton Town for a month's loan to gain first team experience, making his debut on 15 November 2008 in a defeat by Oldham Athletic. His one-month loan was later extended into January, before eventually returned to Bramall Lane having played nine games for the Cobblers. Soon after returning to his parent club, Walker made his full debut for Sheffield United on 13 January 2009, starting in a third round FA Cup tie against Leyton Orient. With the Blades losing a number of players to injury in the closing weeks of the season, Walker was a surprise inclusion in the starting line up for the crucial last two games of the season, making his full league debut for the club on 25 April 2009 against Swansea City. After two outstanding performances he retained his place as Sheffield United entered the play–offs, starting both games against Preston North End and the final against Burnley at the end of May. By playing in the final, Walker became the youngest Sheffield United player ever to play at Wembley Stadium. On 22 July 2009, Walker left Sheffield United to join Tottenham Hotspur along with fellow defender Kyle Naughton for a combined fee of £9m, but was loaned back to the Yorkshire club for the duration of the 2009–10 season as part of the deal. Whilst at Bramall Lane he was virtually ever present at right back for the first half of the season but was unexpectedly recalled back to Spurs on 1 February 2010, just before the close of the January 2010 transfer window, as cover for Alan Hutton who was loaned out to Sunderland earlier the same day. 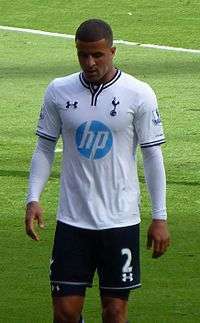 Walker made his debut for Tottenham on Saturday 27 March 2010, in a 2–0 victory over Portsmouth. At the start of the following season, Walker went out on loan once more signing an initial six-month deal with Queens Park Rangers (QPR) due to injuries at the club in the right back position. In mid-October, his loan was extended until 3 January 2011. After he had left QPR, Walker joined Aston Villa on loan until the end of the 2010–11 season. He scored on his début only nine minutes into the game against former club Sheffield United in the third round of the FA Cup in January 2011. At the start of February, Walker scored his first Premier League goal and first senior league goal, a 30-yard strike low into the left corner against Fulham. He returned to his parent club at the end of the 2010–11 season after scoring two goals in 18 appearances in all competitions for Aston Villa. On leaving Villa Park, Walker suggested that he would be happy to return to the club the following season, as first team opportunities were limited but Tottenham Hotspur manager Harry Redknapp later stated that he did not wish to sell the defender. 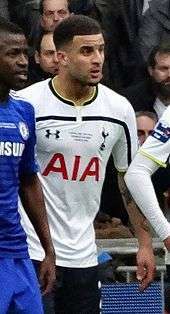 Walker subsequently agreed to a contract extension at Tottenham until 2016. Walker was chosen in the starting eleven for Tottenham's opening game of the 2011–12 season, against Manchester United at Old Trafford on 22 August 2011. On 2 October, he scored the winning goal in the North London derby against Arsenal from 25-yards out. Tottenham won the match 2–1. On 22 April 2012, Walker was named as the Professional Footballers' Association Young Player of the Year, beating the likes of Sergio Agüero, Danny Welbeck, Daniel Sturridge, Alex Oxlade-Chamberlain and teammate Gareth Bale to the award, as well as being named in the PFA Team of the Year. On 29 April, he scored a free-kick from 25 yards to help Tottenham beat Blackburn Rovers 2–0 at White Hart Lane. On 3 May 2012, Walker was awarded with a new five-year contract, that runs until 2017. Walker's performance against Manchester United in March 2012 saw him at fault for two of the opposition's goals in a 3–1 defeat. He began his next season in a similar vein; he was at fault for Chelsea's 4th goal in the 4–2 defeat at White Hart Lane, getting shrugged off the ball easily by Juan Mata. He was ever-present in the first half of the season in the Premier League, with the exception of the 3–0 victory over Fulham at Craven Cottage; this included playing 90 minutes in the 3–2 win over Manchester United, which was Tottenham's first victory at Old Trafford in 23 years. On 28 October 2013, it was announced that Walker had signed a new contract with Tottenham, keeping him at the club until 2019. On 8 August 2015, Walker was involved in an own goal which led to Tottenham suffering a defeat in the hands of Manchester United in the season opener and it also became the first goal of the new season. Before having even made a league appearance for Sheffield United, Walker was called up to the England U19s in February 2009. He made his début on 10 February, coming on as a second-half substitute in a 3–0 loss to Spain U19s. Following his first run of regular Premier League starts, Walker was called up to the full England squad in February 2011 and again in March 2011. However, he did not feature in any of the games played and pulled out of the squad in March due to an injury. At the end of the 2010–11 season, Walker was named as part of the England squad which competed in the 2011 UEFA European Under-21 Football Championship competition in Denmark. Despite the poor showing of the team who were knocked out in the first round, Walker was named in the Team of the Tournament. His good form in the 2011–12 Premier League season saw him named in the England squad for a friendly against Spain. On 12 November, Walker made his England debut in the 1–0 win over Spain, coming on for Scott Parker as a substitute in the 85th minute. Walker went on to make his first start for England on 15 November, in a 1–0 win against Sweden, during which he won man-of-the-match. He missed UEFA Euro 2012 because of a toe injury, suffered in a league game against Fulham. Walker played the first England game after Euro 2012, playing the full 90 minutes of a 2–1 win against Italy. In December 2012, Walker signed a boot deal with Nike to wear the T90 Laser IV which is also worn by Manchester United's Wayne Rooney. From 2009 to 2012, he wore the GT Pro II boot by Umbro. 1 2 3 Hugman, Barry J., ed. (2010). The PFA Footballers' Who's Who 2010–11. Edinburgh: Mainstream Publishing. p. 426. ISBN 978-1-84596-601-0. ↑ "Player Profile: Kyle Walker". Premier League. Retrieved 18 January 2015. ↑ "My dad was petrified I'd get killed on the M1, so I had to follow him to Northampton, says Kyle Walker". London Evening Standard. Retrieved 18 November 2011. ↑ "Walker on the move". Sheffield United F.C. 13 November 2008. Retrieved 24 November 2008. ↑ "Gray upset by defeat". Northampton Town F.C. 16 November 2008. Retrieved 22 December 2008. ↑ "Kyle extends loan". Northampton Town F.C. 22 December 2008. Retrieved 22 December 2008. ↑ "Walker returns to parent club". Northampton Town F.C. 28 December 2008. Retrieved 29 December 2008. ↑ "Progress – on two fronts". Sheffield United F.C. 14 January 2009. Retrieved 14 January 2009. ↑ "No qualms over role for Walker". The Star. Sheffield. 28 April 2009. Retrieved 4 June 2009. ↑ "Kyle, the younger, steals record". Sheffield United F.C. 3 June 2009. Retrieved 3 June 2009. ↑ "Spurs capture Naughton and Walker". BBC Sport. 22 July 2009. Retrieved 22 July 2009. ↑ "Tottenham Hotspur recall Sheffield United's Walker". Yorkshire Post. Leeds. 2 January 2010. Retrieved 2 February 2010. ↑ Ridley, Ian (28 March 2010). "Tottenham 2 Portsmouth 0: Peter Crouch and Niko Kranjcar pile on the pain for Pompey". Daily Mail. London. Retrieved 28 March 2010. ↑ "Spurs defender Walker joins QPR". BBC Sport. 13 September 2010. Retrieved 13 September 2010. ↑ "QPR extend loan of Spurs' Walker". BBC Sport. 14 October 2010. Retrieved 14 October 2010. ↑ "Villa sign Spurs defender on loan". BBC Sport. 6 January 2011. Retrieved 6 January 2011. ↑ "A Houl lot of relief at Bramall Lane". The Sunday People. London. 9 January 2011. Retrieved 6 February 2011. ↑ "Aston Villa 2–2 Fulham". BBC Sport. 5 February 2011. Retrieved 6 February 2011. ↑ "Walker hints at Villa stay". Sky Sports. 1 May 2011. Retrieved 4 July 2011. ↑ "Ten could leave Spurs as club plan for September's 25-man squad". Sky Sports. 25 May 2011. Retrieved 4 July 2011. ↑ "Redknapp will not sell Walker". Sky Sports. 24 March 2011. Retrieved 4 July 2011. ↑ "Manchester United v Tottenham live match report". The Guardian (London). Retrieved 22 August 2011. ↑ "Tottenham 2–1 Arsenal" BBC Sport. 2 October 2011. Retrieved 6 May 2012. ↑ "Walker wins PFA award". Sky Sports. 22 April 2012. Retrieved 22 April 2012. ↑ "Tottenham 2–0 Blackburn" BBC Sport. 29 April 2012. Retrieved 6 May 2012. ↑ "Kyle Commits To New Deal". Tottenham Hotspur F.C. Retrieved 3 May 2012. ↑ "NEW CONTRACT FOR WALKER". Tottenham Hotspur F.C. 28 October 2013. Retrieved 28 October 2013. ↑ "Kyler Walker's own goal gives Manchester United the win in season opener". BBC Sport. 8 August 2015. Retrieved 8 August 2015. ↑ "Another young Blade earns England call". Sheffield United F.C. 6 February 2009. Retrieved 11 February 2009. ↑ "The Kyles get International cameos". Sheffield United F.C. 10 February 2009. Retrieved 11 February 2009. ↑ "Fabio Capello calls up Kyle Walker for England friendly". BBC Sport. 5 February 2011. Retrieved 6 February 2011. ↑ "Squad numbers confirmed". The Football Association. 7 June 2011. Retrieved 6 February 2011. ↑ McNulty, Phil (12 November 2011). "International friendly: England 1–0 Spain". BBC Sport. Retrieved 13 November 2011. ↑ "International friendly: England 1–0 Sweden" BBC Sport. 15 November 2011. Retrieved 3 March 2013. ↑ "England Euro 2012 squad: Ruddy, Carroll & Defoe in, Ferdinand out" BBC Sport. 16 May 2012. Retrieved 3 March 2013. ↑ "England 2–1 Italy" BBC Sport. 15 August 2012. Retrieved 3 March 2013. ↑ "Kyle Walker and his new brand: Nike". FootballBoots.co.uk. Retrieved 13 December 2012. 1 2 "Games played by Kyle Walker in 2008/2009". Soccerbase. Centurycomm. Retrieved 23 August 2014. 1 2 "Games played by Kyle Walker in 2009/2010". Soccerbase. Centurycomm. Retrieved 8 April 2016. 1 2 3 "Games played by Kyle Walker in 2010/2011". Soccerbase. Centurycomm. Retrieved 8 April 2016. ↑ "Games played by Kyle Walker in 2011/2012". Soccerbase. Centurycomm. Retrieved 23 August 2014. ↑ "Games played by Kyle Walker in 2012/2013". Soccerbase. Centurycomm. Retrieved 23 August 2014. ↑ "Games played by Kyle Walker in 2013/2014". Soccerbase. Centurycomm. Retrieved 23 August 2014. ↑ "Games played by Kyle Walker in 2014/2015". Soccerbase. Centurycomm. Retrieved 8 April 2016. ↑ "Games played by Kyle Walker in 2015/2016". Soccerbase. Centurycomm. Retrieved 29 May 2016. ↑ "Games played by Kyle Walker in 2016/2017". Soccerbase. Centurycomm. Retrieved 12 November 2016. ↑ "Walker, Kyle". National Football Teams. Retrieved 12 November 2016. ↑ Wilson, Jeremy (8 August 2011). "Tottenham Hotspur defender Kyle Walker set to make England debut against Holland". The Daily Telegraph. London. Retrieved 8 August 2011. Wikimedia Commons has media related to Kyle Walker.